Any well-drained. Very drought tolerant. Easy and long-lived. Graceful and airy. Also known as Prairie Baby's Breath. Division is tricky and not necessary, but can be used in spring for propagation. Boy, what an ugly name for such a lovely native. I'd been cutting this for years in road ditches for use in bouquets and finally decided that a stand of my own would be less work and more enjoyable. I've also had several requests over the years and so decided to try it at market. This is sometimes called Prairie Baby's Breath because of its airy white flowers (actually white bracts) which appear for several weeks in mid- to late summer on 24 to 30 inch stems. 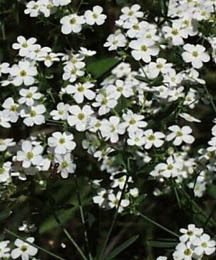 Flowering Spurge will tolerate a wide range of soil conditions including those that are quite dry and sandy. It performs best with at least a half a day of sun. New plants should be spaced about a foot apart. As with most Euphorbias, division is difficult because of the brittle roots.